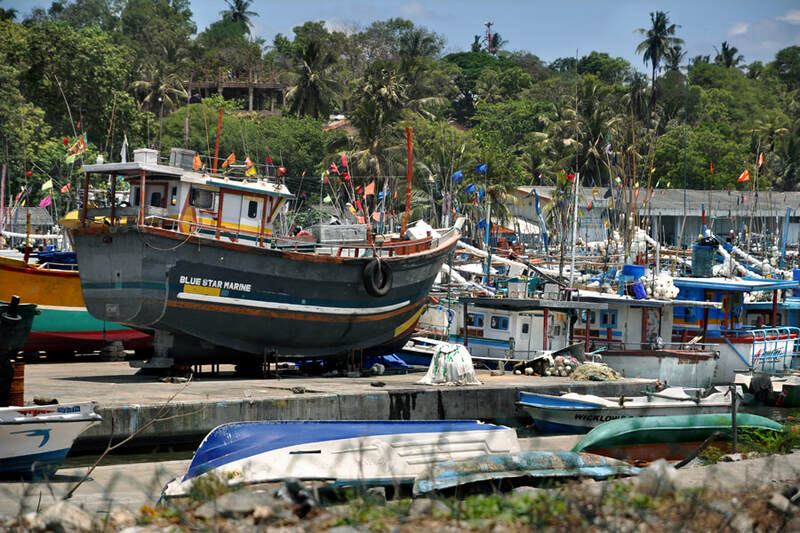 Tangalle is the most important fishin harbour at Sri Lanka’s south coast. In recent years, the beaches near Tangalle have become an increasingly popular holiday destination. One reason is the climate. Tangalle is situated in the intermediate zone. During the monsoon season in northern summer months, Tangale receive much less rainfall and has more sunny days than beach resorts further west near Galle. Tangalle’s rainy season corresponds to that of the eatern dry zone. Main rainy season is from October till December, November being the month with most rainfall. February and July are the driest months with about 50 mm. The entire annual rainfall is only half of that of Hikkaduwa, which is situated only 100 km further west. Another reason for the increaing popularity of the Tangalle region as a holiday destination is the proximity of several national parks, particularly elephant national park Udawalawe and leopard national park Yala are within day-trip distance, 75 resp. 80 km. Bird national park Bundala is even closer, only 55 km by road. The name Tangalle, often pronounced „Tang-Gol“, translates to „protuding roch“ and refers to the numerous promontories to the west. The beaches in between them are better protected than the long beaches at the southwestern coast. Nevertheless, there are strong waves in this area. Because the beaches are smaller and separated, each of them is more exclusive and not crowded with hotels. In contrast, the beach to the east of the city centre is eight kilometres long. There are several mid-class hotels, Ayurveda farms and guesthouses in the vicinity of Galle, both to the west and east of the city centre. The fishing harbour is usually not open to the public. The Dutch Fort of Tangalle is not worth seeing. Similar to the Dutch Fort in Negombo, it is not well-preserved and the area now serves as a prison. Only a few colonial buildings can be seen in the town centre and near the former resthouse at the harbour. Prior to the arrival of the Europeans colonial powers, Tangalle had already been used as a seeport of Muslim traders from Arabia and Persia. The major tourist attraction of Tangalle is the turtle beach of Rekawa, which is at the opposite end of the 8 km long beach to the east of the town, which was mentioned above.